The castle shape drive thru is only open during the warm weather and locals wait for it all year! Whether it's the dozens of milkshake flavors, mushroom fries or their signature Tino's burger, everyone has their favorites. The drive thru is seemingly always packed. 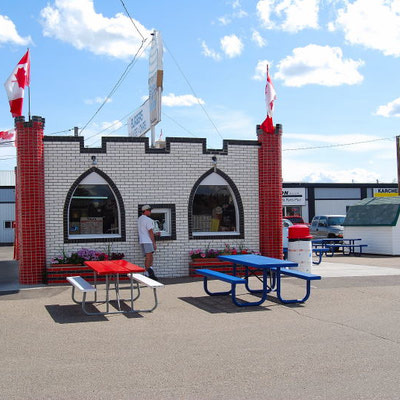 Many people walk up to order at the front window, then enjoy their meal at the picnic tables. If you're short on time, it's always best to phone ahead to place your order! This walk up ice cream store is popular with the young and old alike. 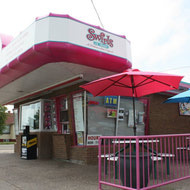 Just a couple of blocks from a local high school, many locals grew up enjoying Swirls Ice Cream. They have soft ice cream and plenty of hard ice cream flavors. In a waffle cone or dish, you can enjoy your treat on the covered picnic tables. A great way to savour the summer days!